Carefully moving aside the spider webs, I peered through the dusty window of the shed. The noise that had attracted my attention continued and I strained through the dirt and grime to see the source. The shadow of a man moved back and forth in front of what appeared to be a table. It was like no table I had ever seen before, the legs were massive, the top looked as if some had chopped and hacked into it. Not the start of a new novel but, like many woodworkers I spend quite a bit of time by myself and I’ve found that my constant companion is more and more podcasts. Thought I would share the ones I listen to most in hopes that you will share the ones I am missing. If you have spent any time on the web looking for woodworking blogs or podcasts you will have crossed paths with these three woodworkers. 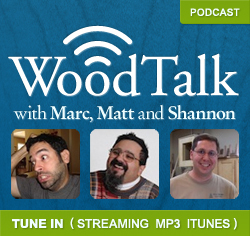 Marc Spagnuola of the Wood Whisperer, Matt of Matt’s Basement Workshop and Shannon Rogers from the Renaissance Woodworker and The Hand Tool School. The blogs of each of these woodworkers is worth a visit and adding to your favorites. The best of these three is found on the WoodTalk Podcast which now comes in every week. Discussions of what’s on their benches, the latest woodworking news and answering listeners questions is a great addition to my shop. THey will answer your questions and in great detail. The humerous discussions, ribbing of the co-hosts all adds to a fun and enjoyable show. Few of the podcasts I listen to are actually woodworking podcasts and in a very different vein is This American Life. I assume many of you have come across this podcast and are avid listeners automatically downloading and listening to the podcast weekly. It is the most popular podcast in the country. So what is This American Life? I think the title tells it best… Each episode follows a theme with several stories that reach deep into the American culture to discover and tell the tales of the America that surrounds us. Although there are times when I disagree with the content and even end an episode early for the vast majority it is a fascinating look into the stories that surround us. I have laughed, cried, felt deeply involved and extremely excluded as I listen to the many stories. Outside of the stories, the podcast is a brilliant display of technical knowledge and story telling. If you ever get the chance to see This American Life Live it is absolutely fascinating. the production of a Podcast/Radio show is a technical marvel and watching this done before your eyes using technology that is accessible to everyone is quite an eye opener. Sign up for the Podcast and enjoy…. Most of the woodworkers that I know in person and on line like be presented with unique and different ways to interpret and solve problems. If we really think about it, much of woodworking is problem solving! What if there was a podcast that talks about the world around us, and seeks to look at it from a different point of view. Freakonomics does just that. Don’t let the reference to economics scare you away, the hosts of the show Stephen Dubner, and Steven Levitt guide the listener to look at things with a twist. There is a blog, books and a podcast found under the radio tab that can be downloaded automatically each week from Itunes. Although there may be other podcasts that I listen to, rounding out the top four is RADIOLAB. This is a podcast similar to This American Life and Freakonomics in many ways. What fascinates me most about RADIOLAB is the way the hosts bring together stories and science, engaging in fascinating tales and investigations into the world around us. I have learned much and questioned more from the stories in this show. It is entertaining and informative and pleasure to listen to. Now it is your turn do you have podcasts that you listen too while you are in the shop? Please share. i don’t think I’ve ever met anyone that listened to all of these podcasts…other than me. Crazy. Thanks Shawn, I was hoping someone would point out a few more to listen to! It would be a fair bet that many of us listen to the same things.